Although the exact dimensions are not known, a good approximation can be made from her insurance papers. It was about 100 feet long and 25 feet wide at the widest. Most cargo ships of the time did not set low with only about 12 feet from the waterline to the keel. This led to the ship bobbing quite a bit at sea. After one Pilgrim fell overboard and was rescued, passengers were required to stay inside below deck. The second deck was called the gun deck and held several canons, powder room, cargo winches, the Pilgrim's small boat and the 102 passengers. The 30 or so crewmen lived in various enclosed places on the main deck. A cross section view of the ship is here: http://mayflowerhistory.com/cross-section/. 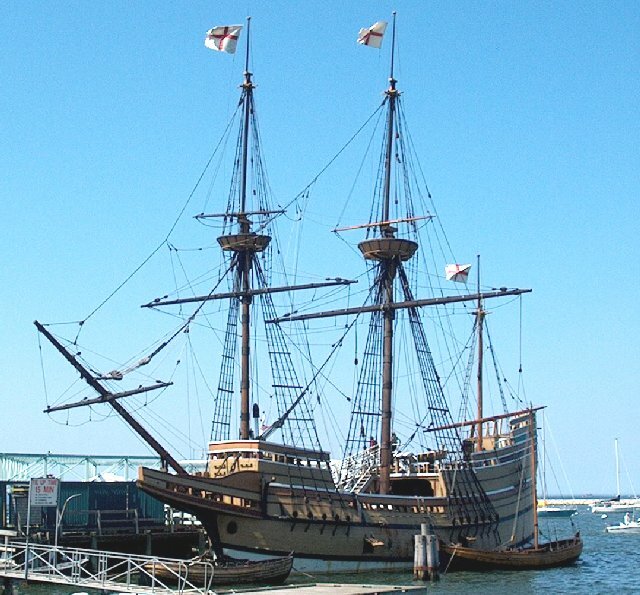 August 12, 1620 -- The Speedwell continued to leak and both ships returned to Dartmouth Harbor about August 12th.